2016 has been a rough one for many. Have any of you seen this meme floating around the interwebs? Makes me chuckle. Although 2016 has been tough in many regards (and I have a year-end wrap-up post in the works with more info on my 2016), it hasn’t been all bad. In fact, I’ve had a pretty good year when it comes to my financial goals. Save $10,000 for down payment for a home. These were pretty lofty goals at the time they were set. But then our income just exploded. I ended up working all summer (an extra 3 months worth of income), I taught an extra class one semester, and hubs landed some big contracts in the Fall. Without any major financial set-backs this year (*knock on wood*) we managed to hit these goals out of the park!! I’ll explain each in more detail below. Save $10,000 for down payment for a home. Once this goal was set, I really put it first above all else. Initially we were going to start looking at homes in May, but we pushed it back a bit when we felt we needed more time to save up an EF, etc. We found “the house” in August and it was a long process, but when all was said and done we finally closed in early November. I wasn’t sure if we’d be able to save the money in-time when we were shooting for a May timeframe, but by the time November rolled around we had more than enough saved for our down payment. With the money we saved (+ a generous gift from my mom) we had just over 20% to put down. We also had some cash reserves still on-hand that came in quite helpful when we needed to buy nearly $4,000 worth of “stuff” to get moved into the house (e.g., refrigerator, blinds, etc. See this post for details). Save $5,000 for an emergency fund. This goal was so important to me, personally. This was the real reason why we delayed our house hunt from the beginning. We had our $10,000 saved up, but had nearly no emergency fund and I felt like it was just a recipe for disaster to buy a home with no money on hand. After we pushed back our original “house hunting” date, we were able to continue to stack money (again – I picked up work over the summer and additional classes in the Fall, too, which really helped in this regard). As I type this post, we have exactly $5,085 in our dedicated Emergency Fund and I consider it fully funded for the time being. Eventually we’ll try to bump this up to a full 3-6 months ($5,000 is about one month for our household…maybe 2 if we really stretch). But while we’re still in the process of debt repayment we’ll leave it at $5,000. I did have some comments on the house post that mentioned making a separate house-related EF (especially given the age of our home, etc.). I’ll address that more in my forthcoming 2017 Goals post. Look for that post likely next week sometime. Some months were up and some were down, but the highs and lows all averaged out and still allowed us to hit this monstrous goal we had set that didn’t even seem feasible in January of 2016 and yet, here we sit at the end of 2016. Mission accomplished. For anyone casually stumbling across this blog (as well as long-time readers – thanks for sticking around!! ), I just want to stand on the top of a mountain and shout: I’M A REAL PERSON. A NORMAL HUMAN BEING JUST LIKE YOU. THERE IS NOTHING SPECIAL OR OUTRAGEOUS ABOUT ME AND MY SITUATION. IF I CAN DO IT, SO CAN YOU!!!! Three years ago, I never would have believed I’d be sitting here today having annihilated nearly half of our debt!!! It’s a pretty incredible things and more great things are on the horizon. How have you done on any 2016 goals? Are you taking stock and making plans for 2017 goals?? 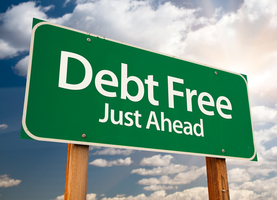 Looking at your list, the last debt you paid off was March 2016; it may be awhile before you pay anything else off, so will seeing those numbers go down be enough to keep you motivated? I know you were excited to see the number start with a 7, and people are motivated by different things. Know that we are still here cheering you on! I loved your “year of being an adult” goals so I tried to emulate that. My husband & I got our wills done, but I still haven’t consolidated my old 401(k)s – like you, I’m trying to find a financial advisor that I trust/click with. Work (and life) has been crazy the last part of the year so I haven’t taken the time to make an appt. I take that back: I made an appt w/the financial guy at my credit union – even left work early one day – and he never showed up! It’s been awhile since our last debt was paid, but I’m still feeling the motivation. I’ve made visual cues (like debt thermometers) that have helped keep me motivated. And our next debt to be paid off will be in just a couple more months – planning to get that balance transfer loan paid off by March 2017. Congrats, Ashley!!! This is AMAZING progress! You continue to be an inspiration… your dedication to get rid of your debt is on a whole different level. Way to go! I can’t wait to see how 2017 plays out for you! Super proud of you for ending the year with a strong debt payment. You’re making great progress and really staying focused – it’s pretty amazing that you’ve been able to maintain the intensity while going through life changes/house changes/job changes. Cheers to 2017! Awesome! Keep up the great work…..and pretty soon you can start dreaming about what you will do with all your extra money once your students loans are paid off!!! Congrats again Ashley (and fam), amazing work. You are such an inspiration Ashley, seriously. 2017 for me will be a year in getting my debt under control. I want to pay off my credit card by March. Then get stuck into my personal loan. My debt is sub $30k in total, and while I don’t have the income that you do, I know that it is doable. You can do it!!! March is right around the corner – good luck with eradicating your credit card debt!! Congratulations on not only accomplishing, but exceeding your goals! I think that’s one of the best reasons to set goals. Once you set them, you usually realize you can exceed them. I hope you can take a moment to celebrate. Ashley, could you please tell me what software you are using to track your debts and budget?